Two of the three Boulder County Commissioner’s seats are up for grab this year, and it’s all but given that whoever secures the Democratic party’s nomination will end up winning the election. In District 1, which includes the City of Boulder as far east as Foothills Parkway (map), we are losing former Boulder mayor Will Toor, who has served two terms — the maximum allowed. Vying for his place are Elise Jones and Garry Sanfaçon. 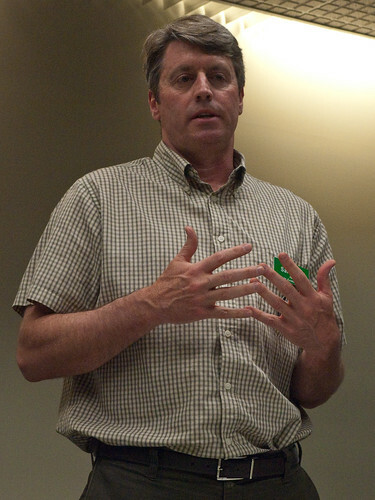 On June 1st, PLAN-Boulder County held a lively candidate forum, moderated by Alan Boles. My notes are necessarily an incomplete record of the exchange. Unless otherwise indicated by quotation marks, the words below represent my paraphrasing of the candidates’ statements. Sanfaçon said that he had never heard of fracking until he started running for the county commissioner’s seat, but that it immediately became one of the top issues. He held up a map of the region, and pointed out the vast number of gas wells that have already been drilled. He said that we need to aggressively assert our rights and protect our community and values. He noted that while the County Attorney has indicated that we cannot ban fracking, outside counsel wrote an opinion saying it wasn’t completely clear. He pointed out that earlier this year legislation that would have very explicitly preempted local regulation of the oil and gas industry failed at the state level, suggesting that at least some parties feel that the existing rules are ambiguous. Jones: Our positions are pretty similar on GMOs, but I recognize that I will have to work with the other commissioners. What we need to do is work with the farmers who are currently under contract, so that we can create stories of successful migrations away from GMOs toward more sustainable ag practices. Those successes will serve us well in future negotiations and publicity efforts. We should create infrastructure at the county level that enables more economical local food production, connecting local producers directly to local distributors and retailers. We also need to look at relaxing some of the restrictions that currently apply to agricultural land in the county — for instance letting farms host weddings or other events on-site — in order to help the farms be more economically viable. Jones: Yes, we should extend EnergySmart. Of course we’ve got to be evidence-based, but there’s a lot of good data showing that energy efficiency really is the most cost effective way to go about reducing GHG emissions. It might be more important to make sure that the city’s Climate Action Plan tax passes this time araound, but I think we can do them both if the city and the county collaborate on their messaging. 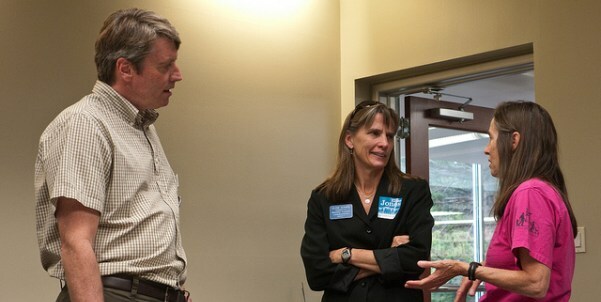 We also need to move forward on a county-wide, zero-waste plan, and on changing our transportation system emissions. We need to think carefully about what the right division of labor between the city and county is on these things. Next Topic: Can a Housing First Project Be Developed with Minimal Controversy? In actuality, this race is already over, except for the few, like i, who were unaffiliated and joined the Democratic party to vote in the primaries. I thought at first Sanfacon was my man, as he’s more the outsider. I’ve tired of the established politicians getting all the seats. But, thinking more deeply, the fact that Safacon was so unaware of fracking just 15 months ago, I’ve changed my mind. 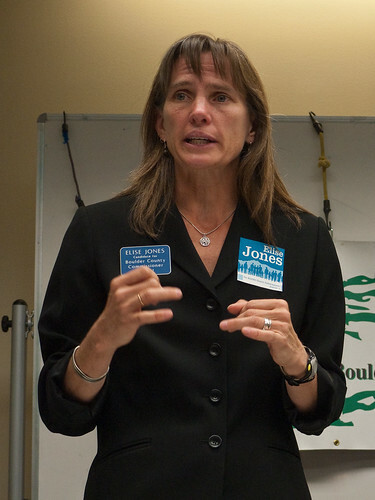 Elise Jones is an insider and I have seen the work of cronyism throughout the City of Boulder and County. Will Elise compromise too much in favor of fracking, GMO’s, etc… I’m hoping not.